Extreme CDrom testing, 220V, driven over by a Porsche and much much more! We’re going to test different cdrom-players todays. Nowadays the performance of a cdromplayer is unimportant for the modding and oc’ing community. All those fancy graphs and numbers, who needs them ! It’s a cdrom, it plays CD’s … so WHAT … ! And as a matter of fact, the reviews are boring and we don’t understand the words they use anyway. If you want to leave some comments on the movie -> click here! OMG, best hardware related movie EVER ! hehe, i'm a little surprised people REALLY like it. It sure was fun 2 make the movie (whilst editing i cried/died several times of laughter) and 2 watch it if you participated ... but i thought/think it wouldn't be an obvious/hilarious movie for "others". And it's the first time we tried ... mucho improvement if we try it again. Maybe we'll make a sequel by popular demand. same thoughts about the appreciation we get ... i felt somewhat the same about it: the making of was a helluvah fun time, but never thought it would really be so funny for other people ... but hey, i'm happy with the result -- friggin job Bosw8er !! quote [H] : "This is a video review, and rated “M” for adult language. I know what you all might be thinking, but this is not your average CDROM review though. 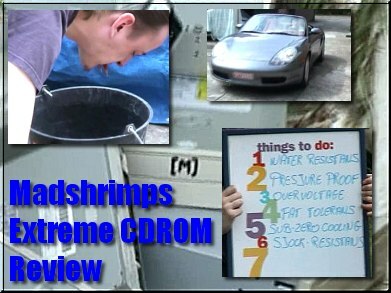 The MadShrimp crew spend some time in the farm ( literally ) running over CDROM’s with a car, hosing them down in a bathtub, and blowing them up, among other things in this entertaining video review. Definitely worth a look." Najbrž ste že vsi kdajpakdaj prebrali kakšen test cederoma ter se enostavno zgražali nad tehniènimi specifikacijami, ki nakazujejo, kako naj bi enota delovala. 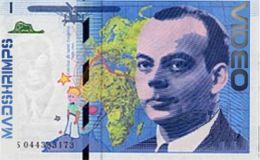 Nato jo stestirate vi ter ugotovite, da se lahko obrišete za tako idealne rezultate. Kmalu obupate ter potisnete izraze kot so "dostopni èas", "hitrost branja na obodu plošèe", "stalna kotna hitrost branja", itn, globoko v podzavest. Pa saj hoèete le, da bo cederom poceni, tih, hiter in nekvarljiv! No, iz laiène perspektive so se tega lotili na Norih Rakcih, kjer so naredili video test veèih CD branikov. Zakaj video? Ker so testi, milo reèeno, kruti [ ]. Klik! 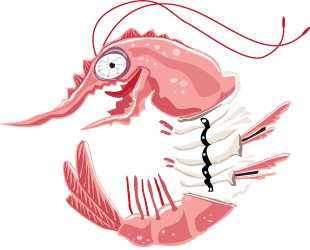 glad you like it KMS, from NinjaMicros forum right? So was that you in the vid ? i started cracking up at that point and couldn't stop laughing...very well done! Systemcooling posted this old review right on 4th July 2004.... Fire works; drinking; driving; Pizza; and Music. This piece will be on every year. next movie when I can get my new Carrera Turbo to splash on sth. back from the dead, our original video hosted at Google Video ; now re-encoded with vReveal and hosted in HD at Youtube (click HD). I think english changed since this video. I'd say you all look much younger than you are in real life, so the IQ is good? vReveal does better with worse source material; if your shots are already quite good, the difference is less spectacular, but if you start out with low quality, you can up it quite a bit. of course it always best to ameliorate the source recording, stable camera work, good lightening etc. Sometimes you don't have the time to do all that, so in that case vReveal will come in handy for sure!